Launched in January 2005, FountainBlue facilitates leadership and innovation through the events we run in partnership with companies across Silicon Valley, through the advisory services we provide for emerging start-ups, and through the leadership consulting and coaching services we provide to tech start-ups and corporations. The ‘Fountain’ in our name represents the innovation edge which keeps companies relevant and the ‘Blue’ in our name represents the leadership needed to bring innovations to the market and to the customer. Bringing the two sides together becomes much more important as we move from an Age of Information to an Age of Personalization. FountainBlue currently runs a monthly When She Speaks series in Silicon Valley for leaders at all levels across the Silicon Valley (since May 2006), our quarterly When She Speaks event in San Francisco and East Bay (since January 2016) which extends our series to SF and EB, our invitation-only VIP roundtable for senior executives (since December 2015), and our invitation-only Salons for world-changing tech entrepreneurs, executives and investors (since February 2018). Since May 2006, we have partnered with tech companies across Silicon Valley every month to profile a panel of women senior executives in high tech companies, speaking on a range of leadership challenges and issues for Silicon Valley high tech women in particular. Our series celebrates women leaders, stimulates critical thinking and conversation around leadership challenges and issues, empowers and inspires all participants, including the next generation of leaders, and builds a proactive, collaborative and supportive leadership community overall. FountainBlue launched a quarterly When She Speaks in SF series in January 2016, and will continue the quarterly series into 2018, while also adding 3 When She Speaks events in the east bay. E-mail us for more information about the dates and themes for our 2018 When She Speaks in SF/East Bay programs. Launched in December 2015 at the request of our community members, FountainBlue’s VIP Roundtables convene executive leaders in monthly conversations on innovation and market trends. 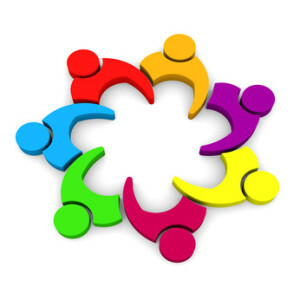 This invitation-only event is designed for senior executives, to facilitate connections between peers and share best practices on today’s hottest opportunities and challenges. Our 2018 VIP roundtables will be organized based on industry sectors. Our Technical Advisory Board, which includes angels, investors and corporate development executives in our community who generously share their guidance on market and technology trends with our community. Our bi-monthly, invitation-only Salons, which gathers world-changing technologists, entrepreneurs, executives and investors to speak deeply and interactively on specific companies and use cases which would facilitate innovation and drive value in a hot market. For information about any of the above services, or to nominate yourself or a stellar entrepreneur/executive/investor in your network, please e-mail us at info@fountainblue.biz with details about your background and interest. 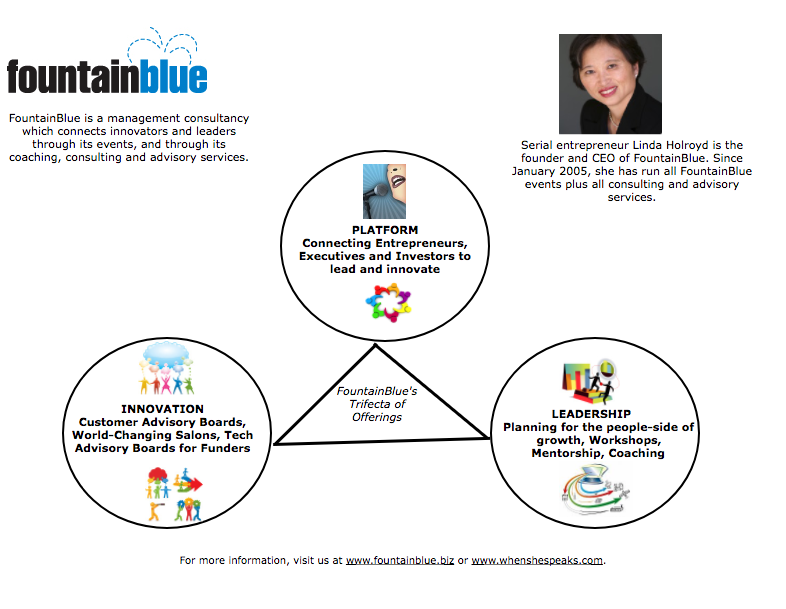 For companies interested in investing in the developing innovation and leadership of their people, FountainBlue offers soft skill workshops, technical skills training (in partnership with training company), coaching and mentorship programs, sponsorship programs, hackathon planning and implementation and consulting services working with senior executives and steering committees. Our consulting services cover the visioning, strategy, planning and execution phases of leadership development and innovation stimulation, working with stakeholders across the organization to deliver sustainable and measurable outcomes. Linda Holroyd is CEO of FountainBlue, founder and organizer for our When She Speaks series and VIP roundtable, and leads our Customer Advisory Board design and implementation services as well as our coaching and consulting services. Linda is a serial tech entrepreneur and recognized speaker and published writer on technology, innovation and leadership trends. For over 20 years, Linda has been leading and advising early-stage, technology-based start-ups on strategy and execution in the areas of marketing, sales, business development and operations. Her passion for innovation and leadership is well reflected in the events we run, the projects we execute and the people we serve. 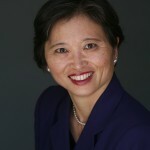 For more information about Linda’s leadership and innovation background, visit http://whenshespeaks.com/linda/. See upcoming events, monthly newsletter and other information at https://www.tikkl.com/fountainblue. From there, you can join FountainBlue’s free mailing lists for weekly When She Speaks events or find out more about membership benefits. Copyrighted 2005-2018 by FountainBlue and all rights are reserved.